The Replicate project’s latest newsletter was launched on the 18th of January 2018; giving all it’s subscribers access to the latest news and information about the project. 2017 has been a year full of excitement for the Replicate project: Our Lighthouse and Follower cities have been working around the clock implementing new and improved Smart technologies which will pave the way of future urban planning; we’ve been all over Europe spreading this knowledge; and now we have our sights set in future events and interventions. 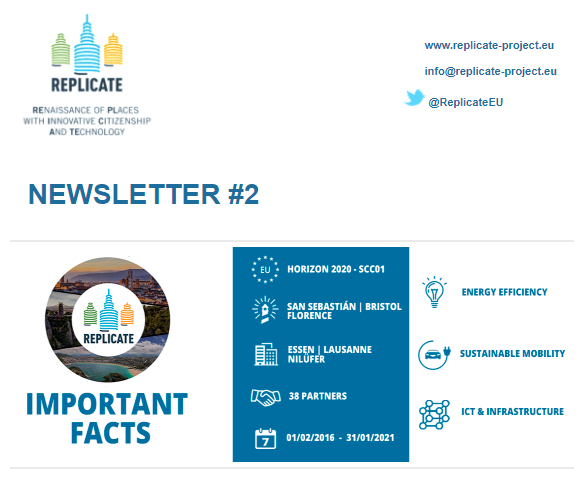 Inside our latest newsletter, readers will find a comprehensive overview of the status of the Replicate project: With updated partner information; an intensive look at the current interventions being carried out by our Lighthouse and Follower cities; Smart Moment highlights; and all there is to know about our upcoming events. If you don’t want to miss on any news, events, and interesting information regarding the Replicate project, follow this link to get primary access to our newsletter, or subscribe to it by clicking on the following link!